As a pet blogger, I love sharing photos of my pets. I'm also a human kid mom, so I like sharing photos of the kids as well. No matter what you love sharing photos of, the new Fotor Slideshow maker can display a collection of photos easily. I've shared Fotor before on the blog, with a few simple effects that the photo editing website offers. If you're looking for a new photo editing website to try out, you should check it out sometime. Some recent Instagram photos. This collage was created with Fotor. Now, Fotor is very proud to introduce their latest feature - Slideshow. In five easy steps as described at their blog, you can make a photo slideshow to share via email, Facebook, or with a link. Here's how it works. You'll need to sign in to Fotor and if you don't already have an account, making one takes less than a minute. You can use your Facebook account or email address to create a new Fotor account. There are 9 different Slideshow templates to choose from. I tried out a couple, including "Slider" and "Vignette". Each Slideshow template comes with it's own music, which I think is pretty cool. When you decide on a Slideshow template to use, just click the "create" button. Fotor Slideshow makes it easy for you to directly upload photos from your Facebook, Instagram, Dropbox, and/or computer. Just choose the photos you'd like to include with your slideshow and you're ready to go. Click the "Go" button to create your slideshow. Next, you'll be taken to a preview of your slideshow. If you aren't happy with the results, just make your edits until you are satisfied. Now that the Slideshow is complete, you can save it. It will be saved to your Fotor account and available any time you log in. You can also choose to share your newly created photo slideshow via Facebook, email, or with a link. Easy stuff! I have created two slideshows so far. The first is simply just some of the most recent Instagram photos that I've shared. To view my Instagram Slideshow, just click here. This Slideshow uses the Slider template, which I think is very unique. 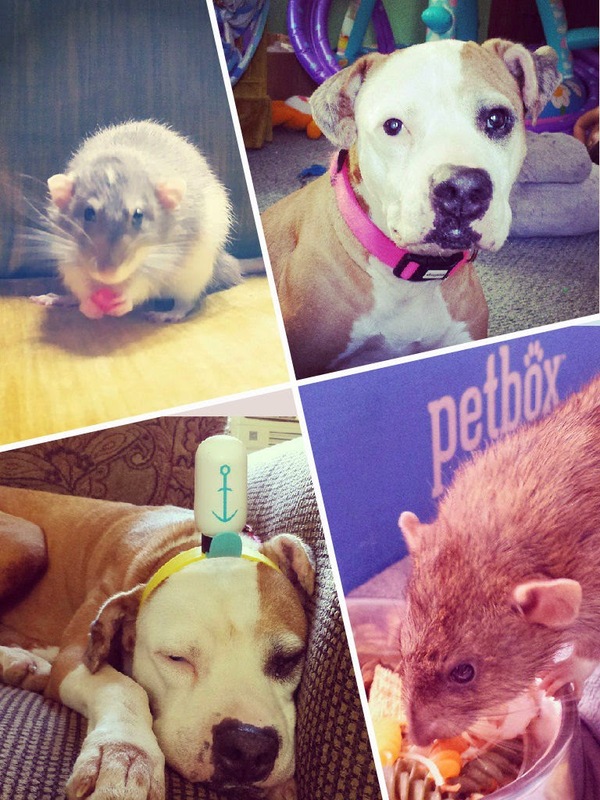 Also, with National Pet Memorial Day coming up this Sunday I decided to create a sort of memorial Slideshow that features my favorite photos of my late pet rat, Nibblet. To view Nibblet's memorial Slideshow, just click here. This Slideshow uses the Vignette template. If you decide to give Fotor Slideshow a try, let us know how you like it! You can click here to make your own Slideshow. This post is brought to you in association with Fotor Slideshow. we totally like fotor, even my mom can manage this program and the effects are super-cool! Love Fotor, reposting our slideshow post tomorrow at their request. It's a great tool! That is very cool! We have an account with them but we always forget to go there. That's pretty cool, I love Fotor and now I love it even more. Thank you for sharing, I had no idea they added that. I use Fotor for editing now and then. It seems every program has something I like better than others, so I volley between PhotoShop, Fotor, and PicMonkey. I got the email about the slideshow but haven't checked it out so this post was perfect. I'm the same way Emma. One of my favorite things about Fotor is their photo collage templates. I've never used Fotor. Definitely going to check this out. Thanks, Ann! I sure want to look into this Fotor. I use Pic Monkey but would like to try this one. Thanks for the info. Have a great Saturday. I miss Nibblet. I got so used to Pic Monkey, I never remember Fotor. I’ll check out some of the new features. That collage looks great. I watched your Niblet slideshow and really enjoyed it! I want to make one of Jewel, but it's just too painful still. When I'm ready, I'll definitely check this out. I'll save the site to my bookmarks. Oh nice! Thanks for sharing this!